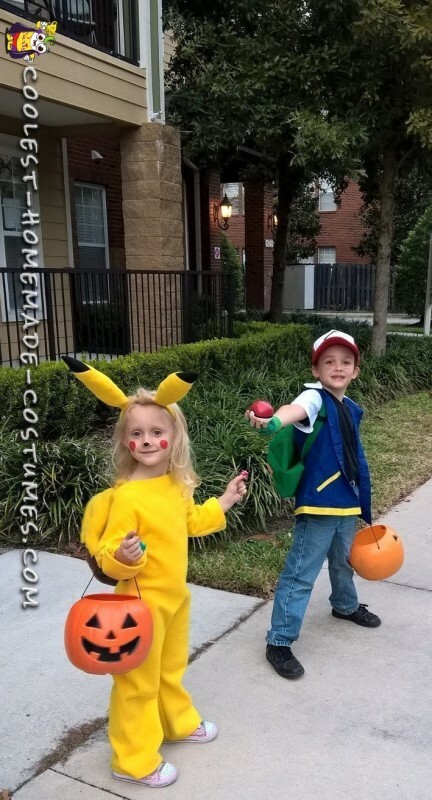 My kids have watched all the Pokemon cartoons/movies over and over and with the excitement of the Pokemon Go game this year they knew they just had to be Pokemon Halloween costumes of Ash and Pikachu. I always make their costumes myself and so this would be no different. 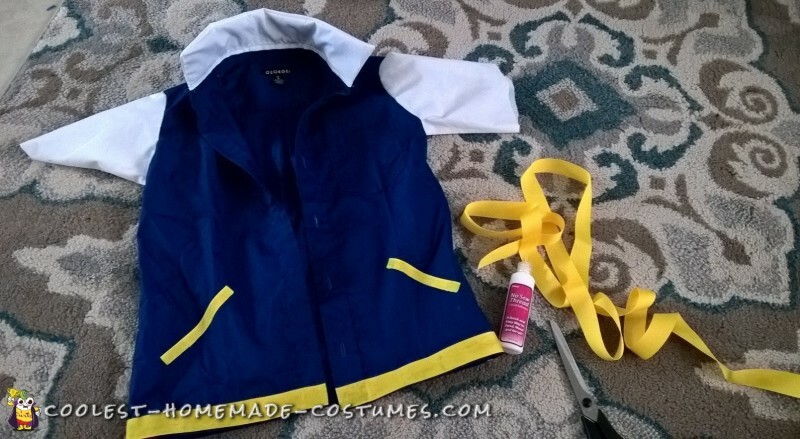 To make Ash’s costume I found both a blue dress shirt and white dress shirt from the local thrift store and I cut and merged the two together. A little hemming and some yellow banding around the bottom and fake pockets and I was done. I made his gloves from a cheap $1 pair of green ones that I cut the tips from the fingers and painted the band with lime green fabric paint. 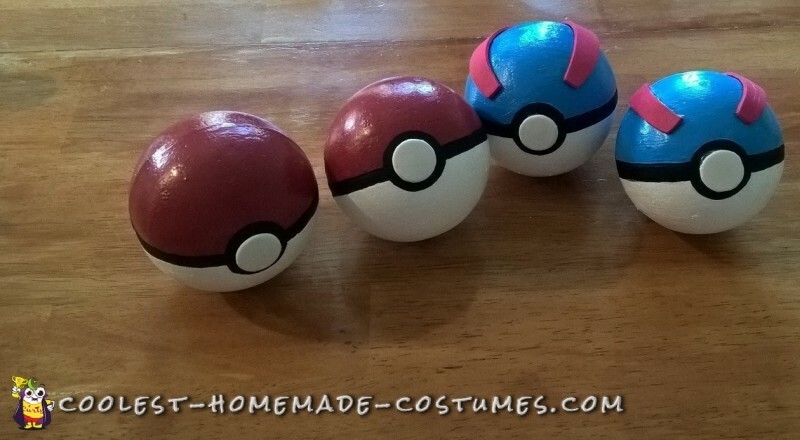 My favorite part was making the pokeballs from styrofoam. I found tutorial videos on YouTube and simply marked and painted them with craft paint and foam. I attached them to a belt we had with velcro so he could wear them just like in the show. 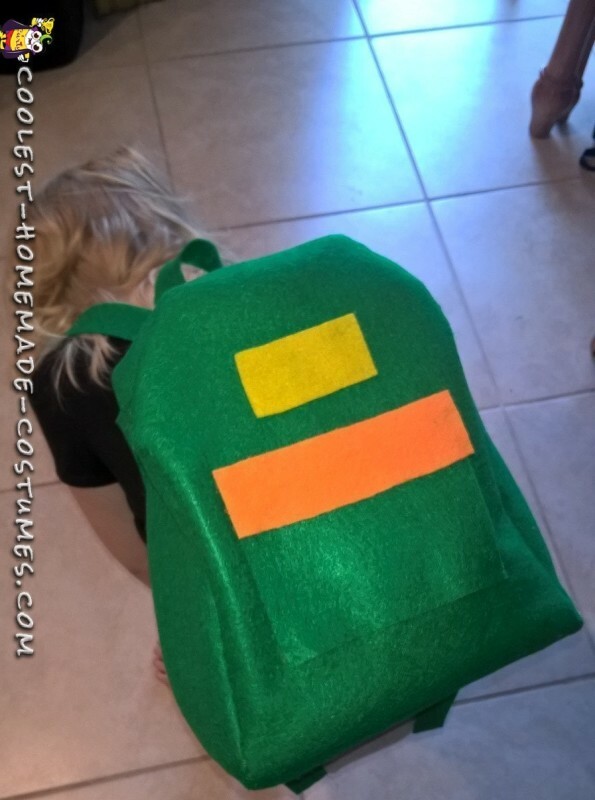 The backpack I sewed from scrap green fabric to look like Ash’s. The hat I ordered for $5 from Amazon and the black shirt, jeans, and shoes were his own. We finished it off with some black squiggles on his cheeks and he had the best costume around. What would Ash be without his Pikachu though? 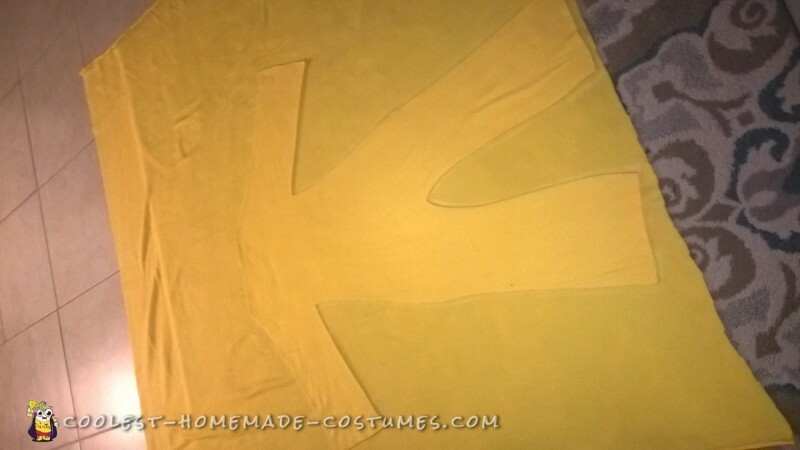 I picked up some yellow fleece from the craft store for half off, brown and black felt, yellow velcro, and went to work. I didn’t have a pattern, so I had my daughter lay down and I traced around her leaving some seam allowance. Then, I stitched all the way around leaving an opening for her head. Next I cut a line straight down the back to add a flap for the velcro. I attached the browns stripes over with some permanent fabric tape, and on to the tail. I looked at a couple images of Pikachu’s tail online and freehanded a pattern onto some paper. Then, I cut and stitched it and finish it off with some polyfill stuffing. I cut a small slit at the base of the velcro on her back and stitched in the tail. To keep it upright I added a few stitches to the top of the tail and jumpsuit. The ears were a little tricky trying to get the right size so I made a couple freehand patterns before finding one I really liked. I stuffed them with polyfill and attached them with stiff floral wire that wrapped the headband to keep them standing upright. 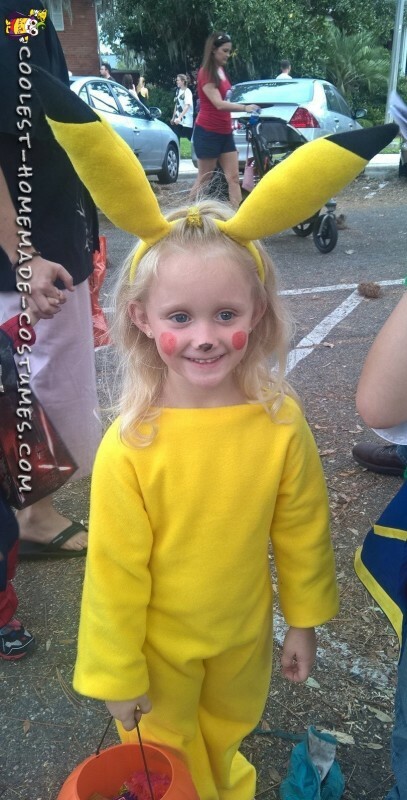 We finished her costume off with some red circles and a black nose. We live in a college town where the sorority girls put on a big Halloween festival every year the Thursday before Halloween. There’s games, trick or treating, and contests. We won several contests with these costumes and they were such a big hit, they had to stop for pictures all night! 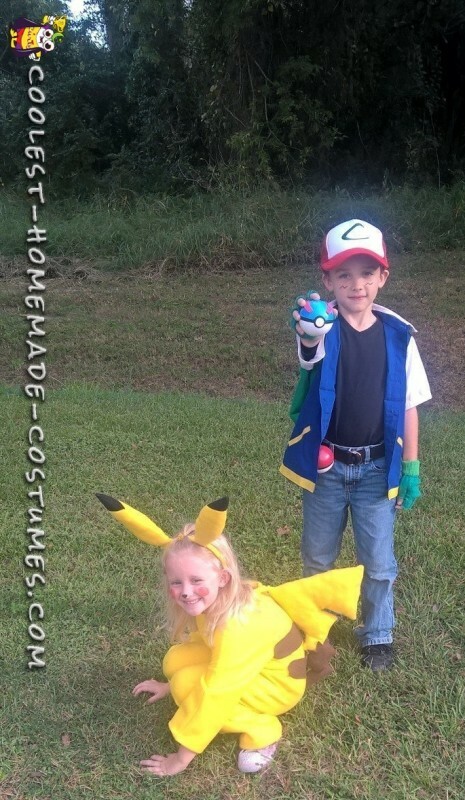 Best costume duo.